In 1985, just 16% of German Rieslings were dry and German white wines were known for their general sweetness. 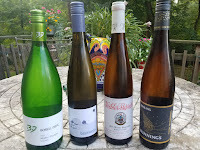 Since that year, consumers have demanded drier wines and German wine producers have responded accordingly such that as of 2016, 46.3% of German Rieslings were produced in a dry style. Wines of Germany is publicizing this fact; as well as the increased quality and dryness of other white varietal wines such as Muller-Thurgau, Pinot Gris, and Pinot Blanc; through the #TasteTheNew promotion. Partnering with Snooth they are offering a German-4-pack for $47.80 which can be purchased here. And this week Matthew Kaner (Wine Director & Partner of Good Measure LA, Bar Covell, Augustine Wine Bar, and Dead or Alive Bar) led a discussion and sampling of these wines for various influencers. Here are my thoughts on the wines. Cheers. Muller-Thurgau was developed by Hermann Müller of the Swiss Canton of Thurgau in 1882 by crossing Riesling and Madeleine Royale - the latter an early ripening table grape. The grape eventually became one of the most widely planted grape varieties in Germany as farmers planted over deflated sugar beets. they found that Muller-Thurgau basically grows like a weed and provides generous yields. Today wineries such as Borell-Diehl crop yields to enhance quality and plant in appropriate locations regarding elevation and soil chemistry. The vines are also grown without systemic pesticides or herbicides and are dry farmed - no irrigation in the vineyards. The resulting wine is delicious heavy with lemon-lime fruit, wet stone, and abundant acids. Kaner recommends enjoying this bargain with oysters. The Pfalz region of Germany has a long history of viticulture where traces of winemaking have been found in Celtic graves as far back as 550 BC. In contemporary history, the Koehler-Ruprecht winery is one of the oldest in the area continually producing wine since the 1700's. Inspired by his grandfather, current winemaker Bernd Phillipi utilizes similar methods as Borell-Diehl with no irrigation, fertilizers or herbicides and systemic treatments against pests or fungal illness are kept to a minimum. In the cellar, Phillipi utilizes long spontaneous fermentations in large, old German oak barrels with extended lees contact. Pinot Blanc shows that this technique produces fuller and creamier white wines without oak influences penetrating into the wine's profile. The wine is floral, creamy, with green apples and lively acidity. Excellent. Do You Know Your Croatian Grape Varieties? Do You Know Your Hungarian Grape Varieties?